So Ive got myself a Adimlab 3d i3 prusa, many failed prints (except for the very first one that was on the SD card! which was just a square with a hole inside) but everything else Ive tried is failing miserably. The adimlab comes with a glass bed, which I levelled using the paper method (I have some feeler gauges on the way from amazon but it wont be for a few days) and ended up getting PLA first layer fine then on the 2nd layer the nozzle would end up extruding and pulling up the first layer from the glass - so I have gone for some scotch painters tape (blue tape) and I get exactly the same issue. It seems to print ok for the first few seconds but then either the PLA is not getting any adhesion to the blue tape or bed or ends up picking up the first layer and whirring it around (literally) around the nozzle. After 6 hours I thought I would be able to get something simple to print but this is getting to be a headache - dont get me wrong - Im learning LOADS from these issues, from understand how 3d printing works with layers, thickness and the material types to understanding how temperamental the whole heat situation is on producing something - so I am learning lots. Im just not seeing any results from what I am learning and applying, to the output I am getting. I have - <again> adjusted my bed level - seeing videos and hearing people doing the paper test and how it must be just right then figuring out (what IS right?) and re-print re-print re-print. Ok so my original heat settings that were on the LCD of the adimlab were 55 for the bed and 195 for the PLA so I have kept to those settings even though Cura seems to start off with 2mm diameter filament and 65 degrees and 210 degrees, changing the settings from that (I tried the cura defaults, didnt seem to make any difference so I have stuck to myu 1.75mm diameter and 55 and 195 temperatures accordingly. I even swapped the PLA I ordered online for the original PLA that was left to print out a basic 40mm cube from thingverse but it made no difference - at least I know its not the material itself which is something. I have some gcode setup scripts that run on the start of a new print job (10cm straight line at edge of the bed which then turns out to work on the printing once the temperatures have reached their setting. Things I do before I print: I make sure the extruder is working by throwing out 5mm and then I remove that (sometimes it gets made into a nice hoop) and extrude another 5mm just to be sure that the PLA is coming out straight. If the issue is bed-level related - what does "some restriction" actually mean - being a bit of a heavy-handed person, some restriction - to me, means the paper would be dragging or "almost" dragging as compared to a fitment of being able to move the paper freely underneath. 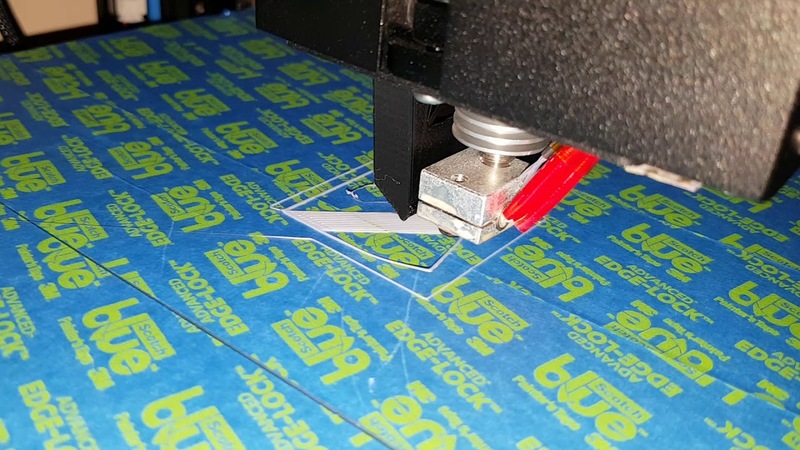 Only just read this but I have managed to get the filament to stick - was too much space between the nozzle and the bed so I performed the paper bed calibration but set it so that the paper was "dragging" rather than "just above dragging point" which is what I performed. I have managed to run two prints, a whistle (which doesnt work but looks cool) and a death-whistle, which works (sort of) but I have gaps between the layers and isnt very strong. Ive got a day and a half to wait for this to get printed - but I am happy now I am getting closer to actually getting things printed properly. Thanks for your help ! Appreciated very much. If there is anything I can do about the gaps in that bottom layer (or is that what it is supposed to do) -looking at the print now (its probably 4 or 5 layers up now) its cross-hatching the layers gapped layers in the opposite direction so I am thinking it might just be part of the brim. Will see I guess - I'll post up the result when its done - Im guessing there's a gallery section in this forum somewhere so will utilise that. Cheers John!